1. Study the flow chart give below and the questions that follow. The purpose of the following chart is to put a zero in each of the boxes 2,4 and 6. 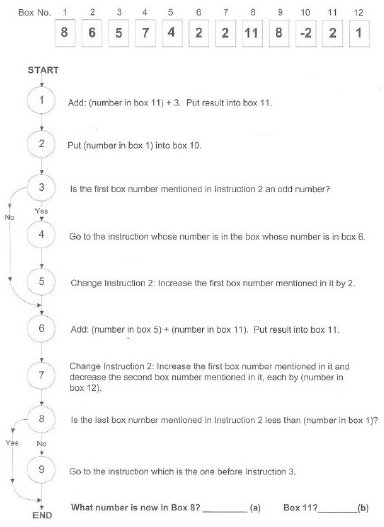 In order to accomplish exactly this - no more and no less - Which number must be in box 3? 2. Study the flow chart give below and the questions that follow. 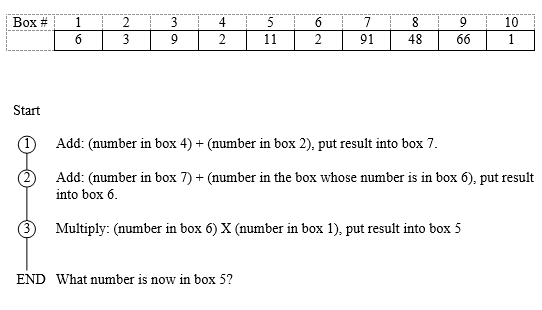 What number is now in Box 8? 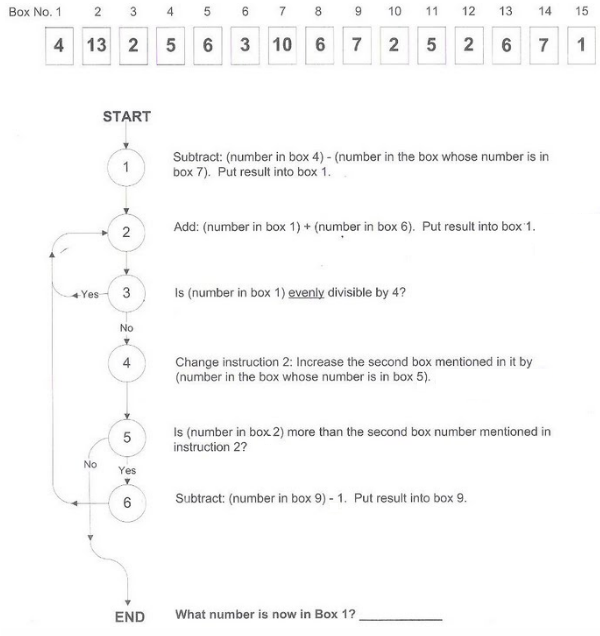 What number is now in box 11? 3. Study the flow chart give below and the questions that follow. 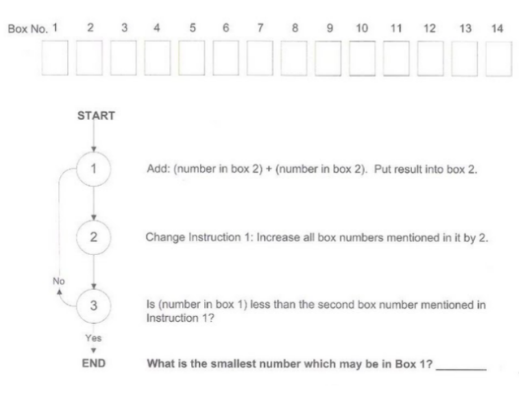 The purpose of the following chart is to double the number in each of the boxes 2, 4, 6, 8 and 10. 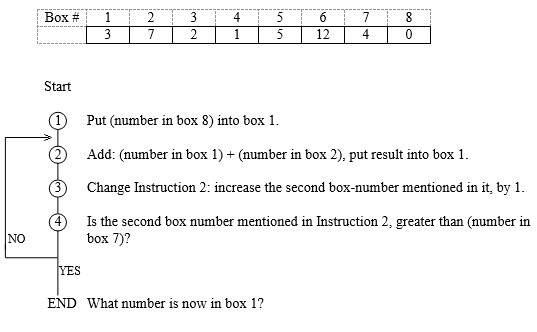 In order to accomplish exactly this - no more and no less - What is the smallest number Which may be in box 1 ? 4. Study the flow chart give below and the questions that follow. 5. Study the flow chart give below and the questions that follow. 6. 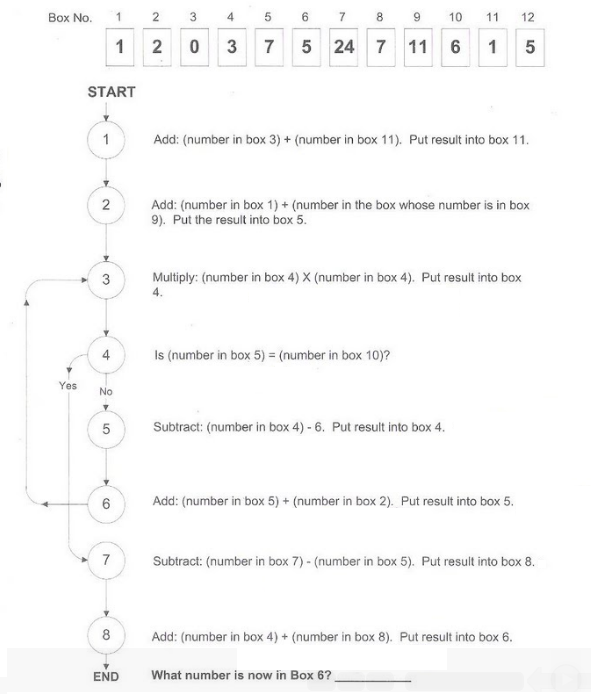 The purpose of the following flowchart is to add the numbers in boxes 6, 7, 8, and 9 and put the total into box 3. 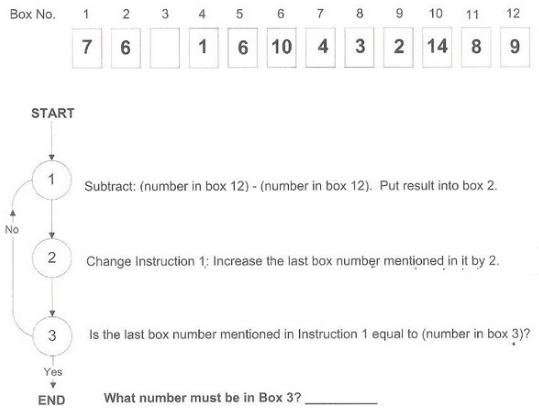 In order to accomplish exactly this - no more and no less - what number must be in box 4? 7. 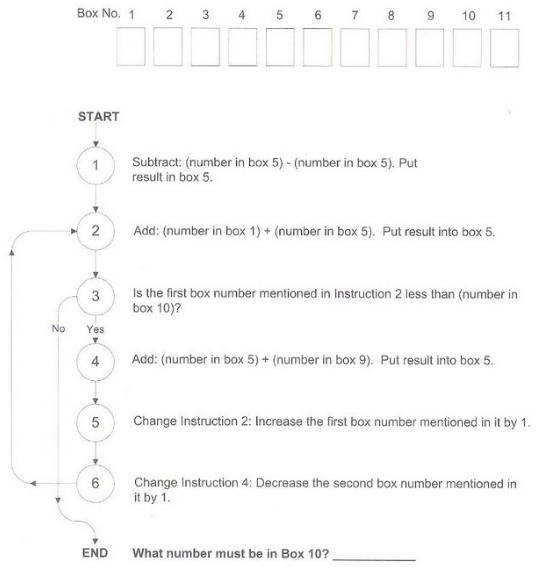 The purpose of the following flow chart is to double the number in each of the Boxes 2, 4,6,8 and 10. 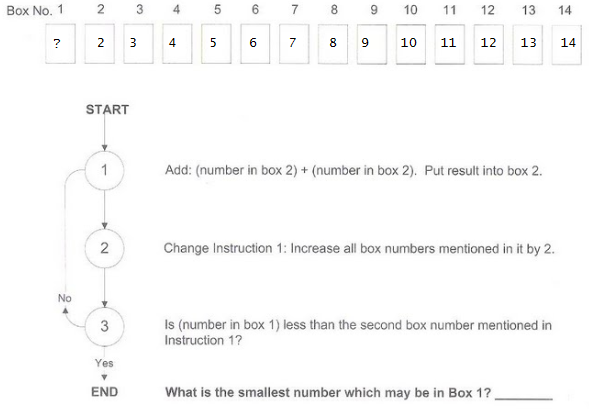 In order to accomplish exactly this - no more and no less - What is the smallest number which may be in box 1? Assume Box 2 has number 2, Box 3 has number 3 and so on. 8. Study the flow chart give below and the questions that follow. 9. Study the flow chart give below and the Answer the questions that follow. What number is now in box 5? 10. Study the flow chart give below and the Answer the questions that follow. 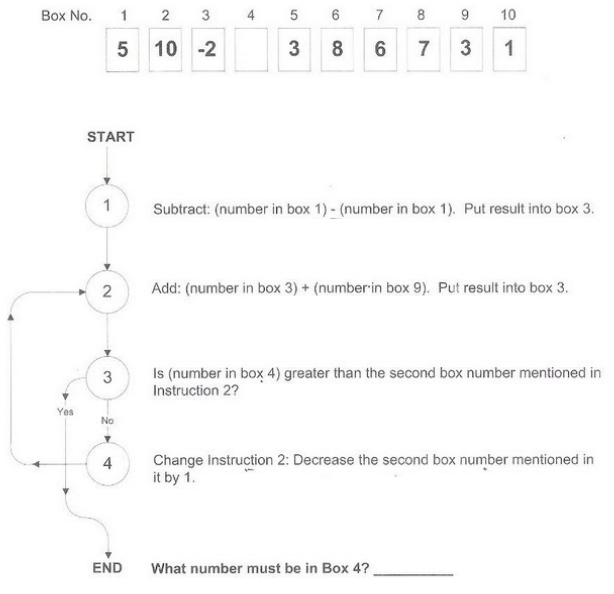 What number is now in box 1?